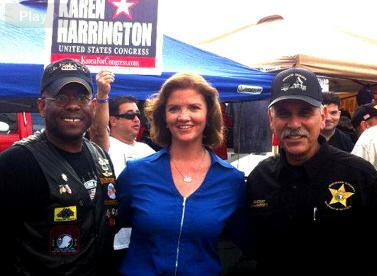 Republican Karen Harrington pulls within 5 points of Debbie Wasserman Schultz. Congresswoman Debbie Wasserman Schultz might want to consider heading back down to South Florida to defend her congressional seat if she’s hoping to get re-elected. Karen Harrington, Wasserman Schultz’ Republican opponent has just released an internal poll she commissioned that has her well within striking distance of Wasserman Schultz. The Gravis Strategies poll of 385 likely voters in the Democrat-leaning 23rd congressional district in Florida has Harrington a mere 4.5% points behind Wasserman Schultz- within the 5% margin of error. The D+11 congressional district is in a traditional South Florida Democratic stronghold, but Republicans and Independents combined outnumber Democrats. In 2010, Harrington lost to Wasserman Schultz by 22 points and was only able to raise a few hundred thousand dollars for her campaign. But this campaign has turned out to be another story, as Harrington raised over one million dollars and has been able to effectively campaign on Wasserman Schultz’ support for President Obama’s failed policies. Shark Tank has more on the race.